"From the Vermont Republican. Vermont Congressional election. By an act of the legislature, of November 2, 1818, this state is divided into six districts, each of which chooses one representative to congress. The first election under this act takes place on the first Tuesday of September next; and the time having already arrived, when the attention of our fellow-citizens must be turned to the important subject, we subjoin for the information of those of our readers who may not have access to the law in question, a compendium of its provisions. ... The Fifth Congressional District [is composed] of The County of Chittenden, except the part thereof included in the 3d congressional district, together with the counties of Franklin, Grand-Isle, and Orleans, and the towns of Middlesex, Worcester, Stowe and Waterbury, in the county of Washington." The Rutland Vermont Herald (Rutland, VT). August 1, 1820. The Heman Allen in this election is also known as Heman Allen of Milton, to distinguish him from Heman Allen of Colchester, who also held elective office. The two men were cousins. 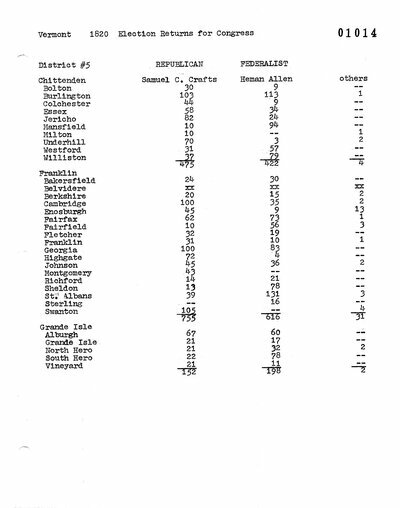 The Original Election Returns tally sheet, The Vermont Gazette (Bennington, VT), The Woodstock Observer (Woodstock, VT) (VT) and The Vermont Intelligencer, and Bellows Falls Advertiser (Bellows Falls, VT) and The Vermont Republican and American Yeoman (Windsor, VT) report 2130 votes for Samuel C. Crafts and 1456 votes for Heman Allen. 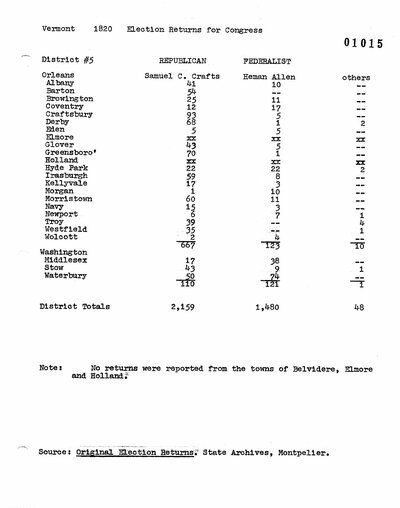 The National Standard (Middlebury, VT) reports 2080 votes for Samuel C. Crafts and 1382 votes for Heman Allen. One vote for William C. Crafts in Milton has been added to the total for Samuel C. Crafts. In Underhill, one vote was cast for Heman Allen and two votes were cast for Heman Allen of Milton. There were no votes recorded in Belvidere. Fairfax Town Records does not list the vote for Joseph Beman. The Original Election Returns tally sheet lists 21 votes for Samuel C. Crafts. There were no votes recorded in Elmore. The votes from Navy were rejected. Troy Town Records does not list the vote for D.A.A. Buck. In Waterbury, 4 votes were cast for Heman Allen and 70 votes were cast for "Heman Allen of Milton." Isle La Motte Town Records. The Rutland Vermont Herald (Rutland, VT). August 1, 1820. Rutland Vermont Herald (Rutland, VT). September 19, 1820. Vermont Gazette (Bennington, VT). September 19, 1820. The National Standard (Middlebury, VT). October 24, 1820. Woodstock Observer (Woodstock, VT). October 24, 1820. Vermont Intelligencer, and Bellows Falls Advertiser (Bellows Falls, VT). October 30, 1820. Vermont Republican and American Yeoman (Windsor, VT). October 30, 1820. Vermont Gazette (Bennington, VT). October 31, 1820. Vermont Intelligencer, and Bellows Falls Advertiser (Bellows Falls, VT). October 31, 1820.